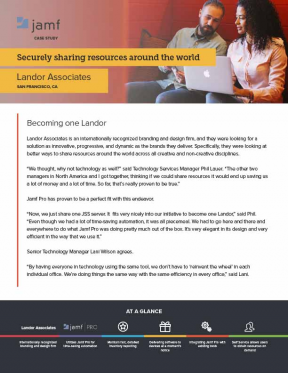 Landor Associates is an internationally recognized branding and design firm, and they were looking for a solution as innovative, progressive, and dynamic as the brands they deliver. Specifically, they were looking at better ways to share resources around the world across all creative and non-creative disciplines. Jamf Pro has proven to be a perfect fit with this endeavor. Efficiency has proven to be a great benefit to having Jamf Pro installed. Phil also enjoys how much less time it takes him to run the reports he needs. Senior Technology Manager James Grabowski has also found the reporting to be extremely helpful in responding to auditors. Phil and Rich credit the Jamf team with listening to clients when developing the software. “It was just six months ago that we were talking about this stuff, and here it is in the new version. Amazing—a software company that not only listens, they act on our collaborations,” said Phil. The support of the Jamf team is making it easier for Phil and Rich to support their offices, and provide a seamless behind-the-scenes experience.